These are ignition interlock systems that are wired to your vehicle. They prevent DUIs by repeat offenders by making sure that a vehicle will not start unless the driver blows into a breathalyzer. We have been providing Guardian Interlock DUI Services since 2001. Put Simply, Guardian aims to reduce repeat offenses by drunken drivers. To date, the Guardian Ignition Interlock devices have already prevented 4,931,988 intoxicated drivers from accessing the roadways. These in-car alcohol monitors incorporate mandatory breath-testing before start-up and immediate lock-down of vehicle’s starting system at the first indication of alcohol to successfully prohibit intoxicated drivers from repeatedly harming themselves and their fellow citizens. Studies show that re-arrest rates have decreased by 66% among individuals who have used Guardian’s Interlock device. We are a business founded on providing technologically innovative and reliable products, and ensuring a cost-effective alternative to the expense of incarceration. Explore our site to learn more about how we became the industry-leader in Interlock devices, and how we can be of service to you. What is the Guardian Advanced Alcohol Monitor Device? 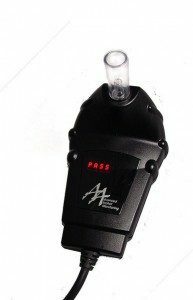 The Guardian Advanced Alcohol Monitoring Device is a state of the art, alcohol-specific ignition interlock. This device is the culmination of over 20 years of ignition interlock experience. How Does the Guardian Alcohol InterlockWork? Simply, we will install AMS2000 alcohol monitors into vehicles through the electrical system. When the device, through a simple breath test, detects more than a predetermined level of alcohol, the car will not start. How Do I Use the AMS2000? Blow into mouthpiece 4-5 seconds until unit beeps then inhale for one second. Blow into mouthpiece for 5 or 6 seconds until unit beeps, then inhale for one second. Contact our highly experienced auto mechanic team in Fort Collins to learn more.